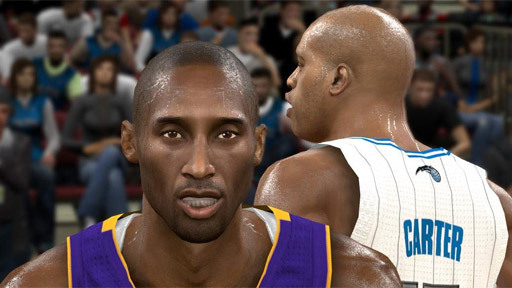 Check out NBA 2K11's new sweat shaders. Absolutely crucial to gameplay. And he does, eventually come to his point: that there are multiple components / "games" that compose sports. 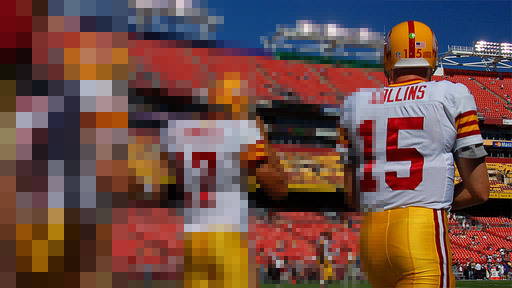 In American football, we might analyze a team's passing game, or maybe their rushing game -- we say they're separate "games" in the sense that they're just different ways of playing, but they're also semi-autonomous systems within the sport itself -- that in a sense, there are sports within sports. So sure, sports games simulate some superficial aspects of real-life professional sports... but give sports games more credit! They're interesting. They're complicated. There's a reason why watching professional sports is so popular throughout the world. 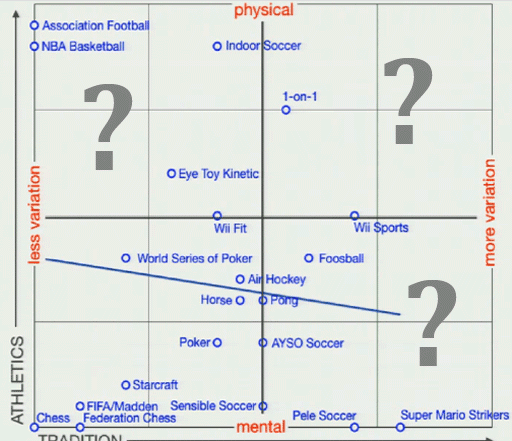 Now, there are many variants in sports: explicit variants, like "Horse" in relation to basketball, or "Catch" in relation to baseball -- but there are also implicit variants in how we consume and participate in sports. Take the statement, "let's go play [American] football." If a 7 year old asks you, maybe they actually mean a game of "catch" in the backyard. If a 14 year old asks you, maybe they mean a game of Madden on the PS3. If your 22 year old buddy from college asks you, maybe he means a large pick-up game with the neighbors. So by Bogost's argument, a sports game is just another way of playing sports -- sports games are computerized sports variants, not just simulations... Madden is a variant of American football, Wii Sports offers a certain kind of bowling, etc. Is this really controversial? We already see a Dragon Age in Flash and a Dragon Age on PC and a Dragon Age on Xbox 360 as essentially similar but different ways of playing the same thing, with different graphics and capabilities and whatnot. This mentality already sort of exists in the gamer community, we just need to apply it to a different context -- to sports. Why is all this theory worth talking about? Well, we can start making more interesting observations about how sports games work, and maybe chart out some unexplored directions in sports / sports games / video games. The point isn't whether to argue if Poker has more agon / competitiveness than Chess; this is just a loose classification to get a sense of where we're going and where we could go. Why do so many game designers ignore sports games? 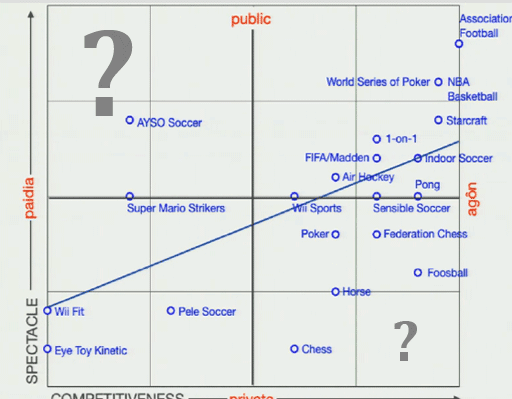 Part of the reason is that we're only interested in what we study, and another part of the reason is that a great deal of "sports gamers" aren't interested in other kinds of video games, so why bother? Just give them what they want. But where is the "FIFA-Ville" of our time, monetizing the deep deep pockets of European middle-aged men? Why does EA only update the roster and cover art and push out a new version of Madden? Why are "visible sweat droplets" the greatest innovation of basketball games in this console generation? We can do better than this! So let's start doing better. Look at the question marks in the charts! That's unexplored territory, under the fog of war. There's no fast travel here; just... potential.